The loud music from bars didn't stop until 3am, so I slept again about 5 hours. I am a little bit tired, I don't know how long I can last this way. For today I have booked a snorkeling tour around Phi Phi islands. 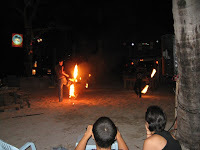 There are 6 island, the biggest being Phi Phi Don, where are all accommodations, stores, boats. It is actually a Muslim village. It might be the most expensive in Thailand. I noticed the prices are, generally speaking, double than in Bangkok. 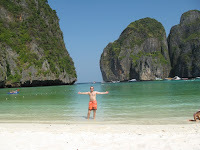 The tour started at 9 and the first stop was Maya Bay on the Phi Phi Lay island. This is the one from the movie The Beach. For me personally was the main reason I come to Thailand: I had to see it for myself. It was everything I have dreamt of, and if I had a bucket list that would be the first check mark on it. Fantastic beach with stunning surroundings. The big boat stopped in the bay and I came by a canoe to the beach. The beach is just perfect. I guess that's way is protected. The downside is there are any accommodation on the island. The only way is to book a tour and camp on the beach. It is limited to 25 people and starts at 4pm and ends at 10 am. After I returned to the big boat I did some snorkeling in the bay. It was just OK, there are corals and fish but not very great. I learned a trick to touch the fish, I just lay there doing nothing, pretend I am dead. Water is very salty and I can float without moving (or maybe I am just that fat). The fish approach me and some of them even try to bite me. The next stop was on the Phi Phi Don island, at Monkey beach. The snorkeling here was a better than in Maya Bay. I just couldn't have enough. The time went so fast, we had to get going. 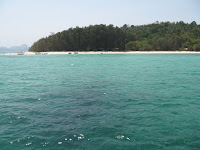 After a little lunch we went to another island, north on Don, named Bamboo Island. I went by canoe to the beach and walked around. This was the fines sand I ever seen. Almost all around the island water was shallow crystal clear, that very light green. I did a little bit of snorkeling but wasn't that great. The last stop was at the shark point on main island (Don). This was absolutely the best snorkeling around. I didn't see sharks, but I saw tones of different fish. If I wouldn't get that sunburned I would definitely come back there tomorrow to snorkel all day. I am now like a fried chicken, although I did use sunscreen many times. I guess there are no roses without thorns. Sometimes is like this, whatever you like the best is hurting you the most. Despite all my suffering, I still went out and spent a couple of hours at the beach, having a drink, watching a fire show, listening to the music. Just another beautiful day.